This week, Marks JCH hosted our Annual Job Fair for adults, bringing more than 50 employers and more than 600 job-seekers together under our roof. In addition to meeting with prospective employers, clients were given access to financial, health care, employment, and vocational consultations from Marks JCH consultants and job developers, promoting our 360 degree service model. 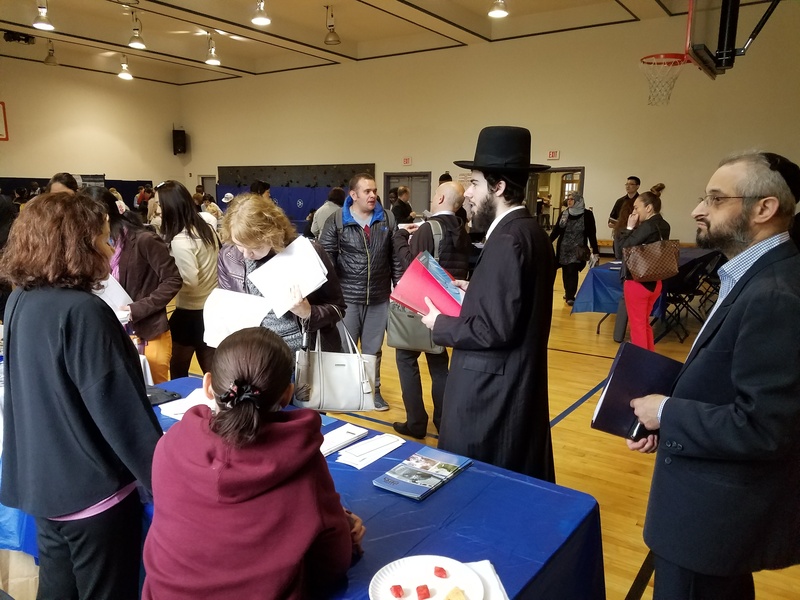 The Job Fair is part of our Career Connect program and is funded by UJA-Federation of New York, NYS OTDA, Robin Hood Foundation and Tiger Foundation. Earlier in the week, the main hallway at the J was recently filled with hundreds of teenagers and young adults from our community who were awarded a highly prized spot in our Summer Youth Employment Program (SYEP). Marks JCH SYEP is funded by New York City’s DYCD (Department of Youth and Community Development) and places over 550 teenagers in summer jobs each year. Marks JCH staff work with the teens and their parents on the complex enrollment process, train them in all aspects of their (often) first employment and provide them with an invaluable summer experience to help set the foundation for their self-sufficient future. As a next step in their employment process, teens will attend a job fair with over one hundred employers from Brooklyn and beyond, with jobs ranging from retail to camps and hospitals. Our biggest employer in the Summer Youth Employment Program continues to be the TJX companies (6 Marshalls and TJ Maxx stores in NYC). Huge thanks to our alumnus, friend, and supporter Ben Cammarata. Last year, TJX employed 110 participants; this year they are already committed to hiring 180! The attached picture, as well as the rising numbers of teens and young adults applying for SYEP, shows that our community is still in desperate need for help on the road to achieving self-sufficiency. Obtaining access to employment remains our priority for helping to lift people out of poverty. The magic of the “J” is its power in galvanizing our whole community. SYEP and our American Dream Self Sufficiency Center do that and more. We thank you for your support of these critical programs, job sites and connections.